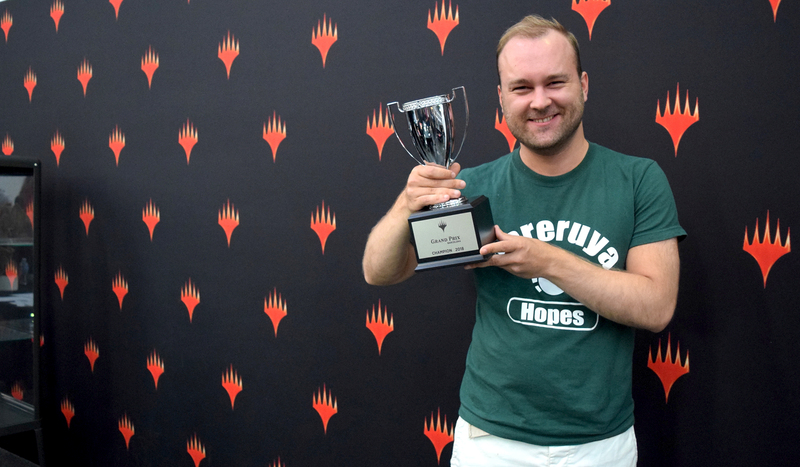 Dredge player Matti Kuisma defeated everyone and everything, including Louis-Samuel Deltour's Krark-Clan Ironworks in the finals, to become champion of Grand Prix Barcelona 2018! The hashtag for Grand Prix Barcelona is #GPBCN. Join the conversation. 1,547 players gathered in Barcelona to test their mettle in Modern and to celebrate the 25th anniversary of Magic: The Gathering. The Top 8 was filled with white-blue control players, including (9) Javier Dominguez who repeated his performance from Grand Prix Copenhagen three weeks earlier. But in the end it came down to two quick games between Louis Deltour's Krark-Clan Ironworks and Matti Kuisma's Dredge. Deltour earned his third finalist's trophy, while Kuisma dredged up enough resources to claim the crown. What had started with 1,547 Modern players in total was reduced to a mere 300 at the end of the first day here at Grand Prix Barcelona. Leading the charge into the second day were ten players at 8-0: Abel Molto, Nick Waugh, Pedro Soler, (9) Javier Dominguez, Mattia Rizzi, Pierluigi Calvanese, Raul Vallejo, Juan Mi Sierra, Louis Deltour, and Jarcque Henning. They would have a head start over the competition on Sunday. But strong competition wasn't far behind. Just looking at the players who finished the day with records of 7-1, one could find Pro Tour champions Lukas Blohon, Ivan Floch, Martin Dang, and Guillaume Wafo-Tapa as well as Pro Tour finalists (5) Márcio Carvalho and Pierre Dagen. It was going to be an exciting race to the Top 8 tomorrow. Check back then for updates, decklists, and for the conclusion of Grand Prix Barcelona 2018!